Hooray – it’s the first day of summer! 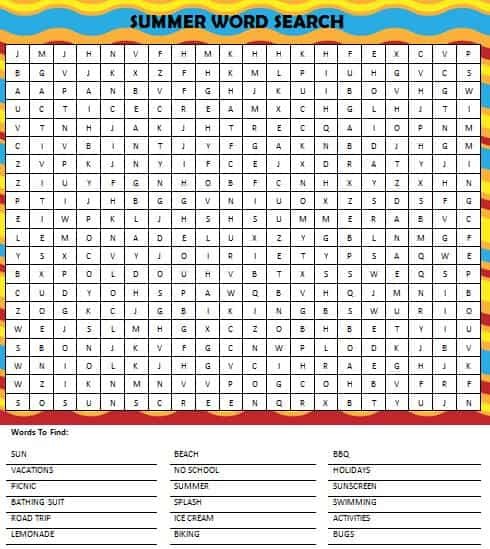 To kick off the start to the summer season, I’ve created this free printable summer word search. It’s a great way to keep the kids busy in between all of your fun summer activities. A tall glass of lemonade, this game and a highlighter is a great way to have the kids come inside to cool off from some of that summer heat. What words come to mind when you think of summer? Are they listed on this game? What are your favorite summer activities? Let us know in the comments below. Trips to the ice cream shop are certainly on the top of my list during all four seasons! We have plenty of more ideas where that came from so feel free to do some searching around old posts. We also have many free printable games to enjoy with your family – check out our Free Printable Games page. We’re always adding new fun ideas so be sure to follow us on Facebook, Twitter, Pinterest or our new RSS feed Bloglovin’ for the latest ideas for family fun.